This year was a late start for me. I usually have a few races under my belt by June, but I must have been drinking when I made my schedule this year. Eagleman on a Saturday and 6 days later Patriot. Both 70.3 Aquabikes. 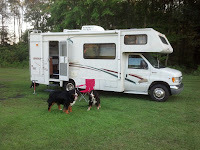 We went big this year and added an RV to my collection of gadgets for my races. We're still learning, but it is REALLY nice to have a giant changing room, and BED to take a nap on the way home! 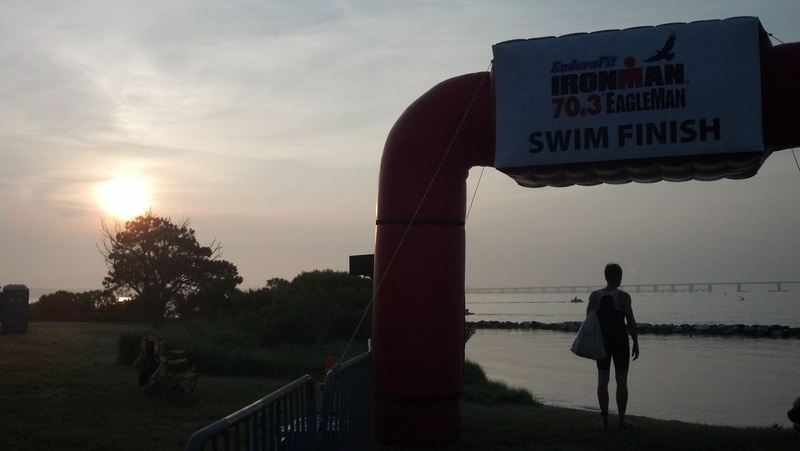 I love the Eagleman / Chesapeakeman course and race company. It is in the Choptank river and the bike is flat, flat flat & windy. Like hilly races, you love or hate the terrain. I watched the water temperature all week, it continued to climb and was rapidly approaching a non-wetsuit race. Sure I can swim sans wetsuit, but to me it's like riding a mountain bike on the road, I'd much rather have my wetsuit! Tropical Storm Andrea surprised many of us and rushed in. The water temp fell and remained a balmy 73 perfect degrees! BUT, with Andrea came 4" of rain in a park that is called "GREAT SALT MARSH" - guess what a marsh looks like after 4" of rain? More on that in a bit. Packet pickup was a large affair. I arrived Saturday afternoon and it was packed. The volunteers and TriColumbia had a smooth operation to get everyone through the pickup, get your swag and get around to the vendors. I love the newest trend of the 'virtual swag.' No more 20 postcards in a bag that you're just going to throw away! YEA save some paper! 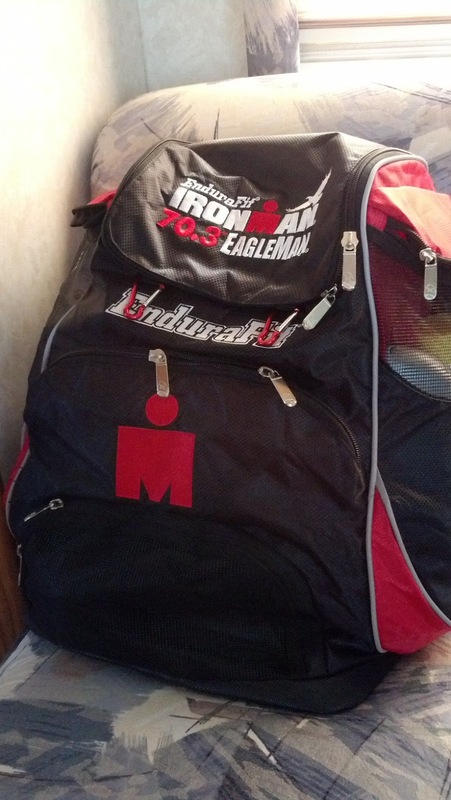 I got to the end of the line and found this SWEET transition bag. I'll take it :). I wondered into the Ironman merchandise tent, fully expecting to purchase a 70.3 shirt where they print all the participants on the back. Turns out they 'forgot' to put Aquabike on there. I figured it was ok, but Relays were there and the Ironman lady said "yea sorry, all participants were supposed to be there, I've written a note for next time." !?! I told her that means I should get one for a discount and she just walked away. They didn't get my money. We found a parking spot for the giant RV and I began to put my bike back together. I noticed that my rear brakes were sticking, that would make for a LONG ride. We both tried to figure out the necessary adjustment and nothing was working. I figured I'd ask the next guy to pass by, this very nice guy said "oh yea I had that bike, and THAT brake was the only thing I didn't like." He was super sweet and did a quick adjustment UNDER the frame and I was all set. Thank you PRO TRIATHLETE KYLE! I then headed over to rack my bike and do my obligatory plea with the race official to rack it handlebars up. There are strict orders that all bikes must be hung by the seat. Well, I"m 5' tall with a 48cm bike, if I hang my bike by the seat it dangles. And if there's any wind it bangs into the bikes next to me. I have to plead this case every time, the officials are usually great about it, but then at least 10 volunteers or OTHER officials yell at me to move it. Oh well, I always have to be difficult! I met up with fellow blogger Amy , we went for a swim. (I'd add a picture of the two of us but she won't sent it to me LOL) The water was chilly as I choose to do a non-wetsuit practice swim, but it felt great! It was a little murky but that's to be expected with a storm churning up the Choptank. John and I then headed over to the High School to 'camp.' There are no campgrounds around so TriColumbia arranges for camping at the HS. There were several RVs there and Tents. I really couldn't imagine sleeping in a tent, then doing a 70.3. Those people should get an extra medal! The evening was great, Tri people are great, Apollo was a total chick magnet. 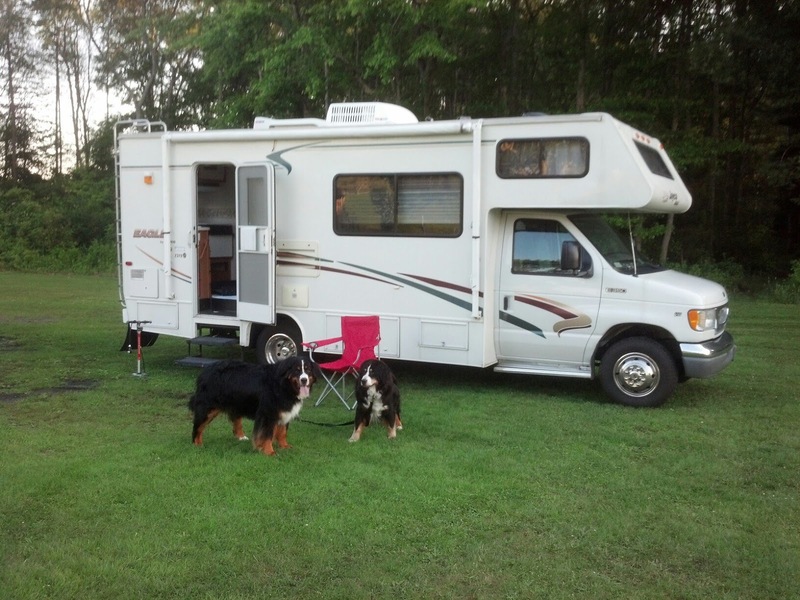 Even complete with two little girls screaming across the parking lot "BERNESE MOUNTAIN DOG!!!!! 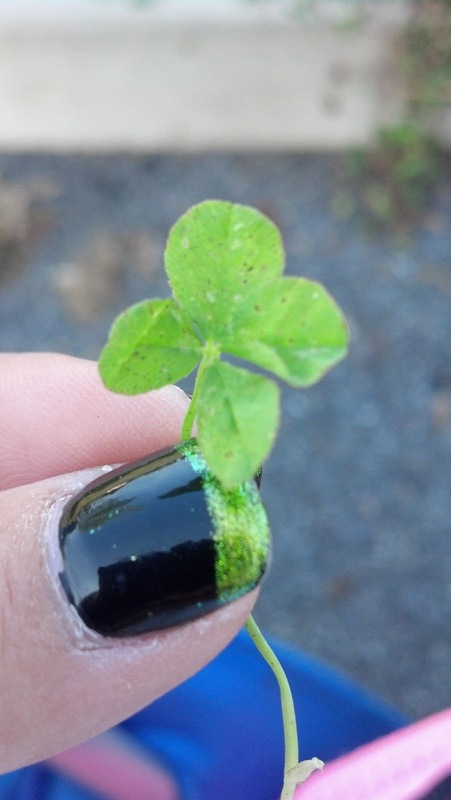 I even found a 4 leaf clover. I fell asleep and of course was up at 3AM without an alarm. I finally got out of bed and we headed back over to the park to get a much in demand parking spot. For those that are trying to get a front spot, 4AM is NOT early enough! We were about a block away so not too bad, but with an old dog the block plus the 300 yards inside the park were tough. I knew the mud was going to be bad, but I didn't really expect what I saw. 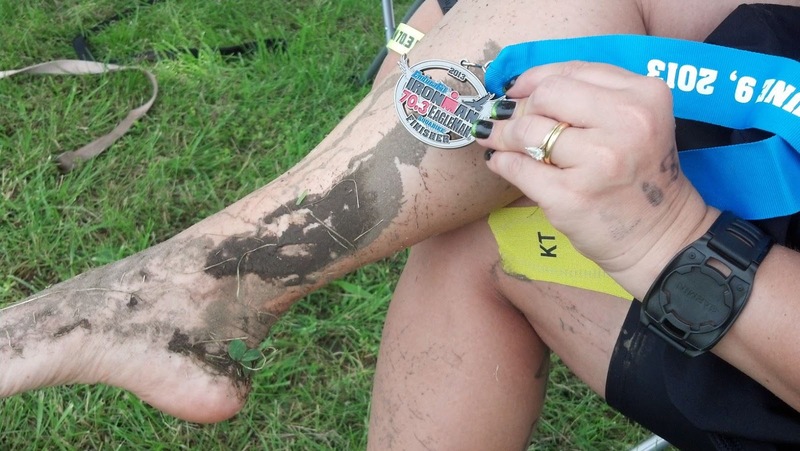 You step and the mud covers your entire foot, and in some places up to ankle! I kept thinking.. hm what will I do for bike out? I've never mounted with shoes ON the bike. I ended up strapping my shoes to the handlebars and packing a ziplock with paper towels. 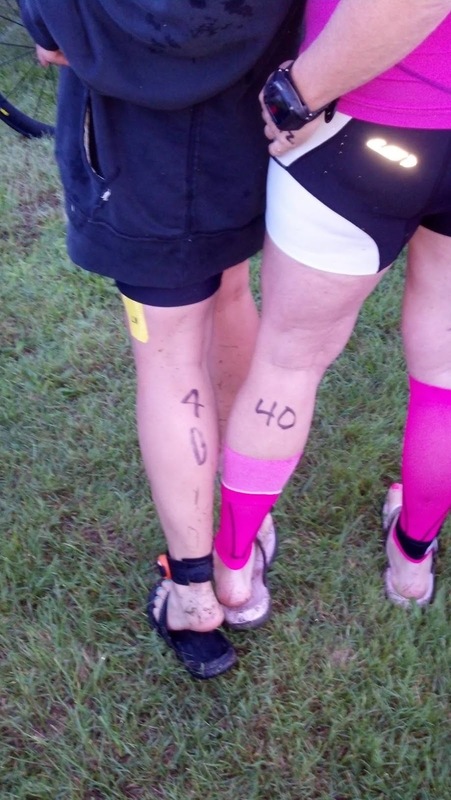 I planned on carrying my bike through the mud, wiping my feet outside of transition and then putting on my shoes. I followed through with MOST of that plan on race day. I neglected to add a separate water bottle in my rear cage. I simply use the speed fill when I have aid stations. So that meant I had no water to remove the MUD from my feet. I improvised, sucked liquid out of my speed fill and spit on my feet ! (oh the gross things that happen triathlon). I wondered over to the port-o-potty and snapped this picture in line. The water looked perfect. Then I connected with Amy as it was the first time we both had a Four OOOHHH on the leg! She clearly had a better body marker! I was in the 3rd wave, just after the Pro women. The start was uneventful, I always head outside front. I get kicked and bumped but never that bad, UNTIL TODAY. They started paratriathletes, aquabike and relays together. I noticed an athlete towing a boat next to me, and it turns out we were the EXACT same speed. I tried to speed up and go around him but I knew that I couldn't afford a speed burst like that this early. I tried to slow down, but it wasn't enough. So we swam next to each other. This was fine until the first turn. He cut the buoy and pinned me and a few other swimmers between the boat and buoy. We had to stand up (yea we could stand there). Next time I'll try to avoid the boats. The swim had a current against us for the first leg, then the return leg was this strange pushing to the side. Everyone said they had slower swim times than normal. I'm totally cool with a slower swim time due to conditions, but I'm not cool with poor sportsmanship causing delays. Around the 2nd turn I went WAY outside again in my attempt to get out of the way of the crazy people seeking Kona slots. I was kicked, swam over, bumped, which is normal and expected. THEN, I was about 20 yards away from the inside line with no one around me, and this guy climbs up my back and punches me in the arm. PUNCHES, WHO SWIMS WITH A FIST? He did startle himself and mutter 'uh sorry.' Ok fine, I had a Charley horse and my arm didn't work correctly for a bit. I swam away from the guy and he seemed to follow me. He kicked, bumped or pushed me at least 8 other times. I was just waiting for him to climb over my feet! I ended up with a huge bruise on my arm. I got out at :55, a TERRIBLE swim for me, but considering the contact swim and the extra .2 miles I swam, I wasn't surprised. I found my bike and contemplated the cyclocross/mud run I was about to do. I picked up my bike and jogged through transition. I couldn't throw it over my shoulder because of the speedfill, so this is the best I could do. About 1/2 way one shoe fell into the mud, so lesson learned, strap those buggers down better! A quick wipe on the shorts and it was fine. I was off, it was a perfect day for this course. Sunny, cool, and NO WIND. Well there was some, but nothing like it can get. I was happy with the bike. I cruised along, riding in intervals and really pushing myself. I set my watch to eat/hydrate and stand up every 30 min. I often forget all 3 of those. I can sit in aero for hours, so I have to set the alarm to get up (or I WON'T be able to get up!). I saw a ton of drafting and pelotons. I'm always shocked when I see deliberate drafting. I'm paranoid I'm going to get whacked sometime because I take longer than 20 seconds to pass someone. There were so many rude athletes, they would pass without a peep, with only inches to spare. I could care less if they want to cheat, but don't put me in danger! I mentioned this on an Eagleman site and a guy told me that I should worry about me and not everyone else. uh ok thanks, but I kinda like my skin ON my bones. I saw so many cases of rudeness on the bike. This surprised me too, because usually I find triathletes are awesome, encouraging, and pleasant. Seriously why race if you are miserable? I was approaching an aid station and one guy threw his water bottle under my wheel. He missed me by 5" or so. Why on earth would you throw your bottle UNDER someone's wheels. I am CLEARLY not his competition. I had someone else yell MOVE in the aid station. I was going about 15 mph to get my water from a wonderful volunteer. The volunteer rolled his eyes at the jerk too. I grabbed a banana from one station, peeled and began to eat it while in aero. This peloton 4 wide and at least 10 deep came whipping round this corner. They didn't speak as they passed me, they're lucky I cut the corner wide or I would have wiped out the whole crowd. Because I was in an early wave, I had a ton of jerks to pass me. About mile 30 or so it started to thin out and we were left with the normal, nice people again. So a group of us were together, not pace-lining, just kind of back and forth. There was a deer LEG in the middle of the lane. No guts, blood, blood stain, just a leg with fur and a hoof. The guy next to me passes and says "that is the first time I had to yell out "LEG" on a ride." I enjoyed the ride and was cruising along , I ended up with a 16.4 avg and it would have been 16.8 if I didn't spend 4 minutes on the whole mud/shoe thing. That pace was super slow for the rest of this field but pretty fast for me. those who ran through it with shoes on pushing their bikes. UGH poor bike! The finish line was disappointing. You run off to the side and they hand you a medal. You can hear the 'real' finish line off in the distance. (I'll write about Patriot in a few, they use the same finish line for everyone, and it is a much better experience that way). Just after the finish John found I had a MUD EAGLE on my leg! But hey in spite of the issues and the jerks, I had my cyclocross/mud run/half iron Aquabike medal! And I did have fun! **I know I've been slacking on the actual blog posts, I do frequently update my facebook page though: facebook ! 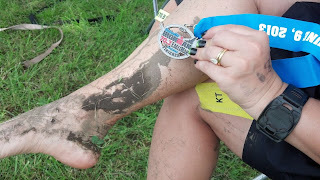 Great race report...and I PROMISE to get you the pictures! Soon...LOL.